IN his continuing search for the more weird, whacky and wondrous in the world of travel, David Ellis says you wouldn't want to be a hotelier at Boryeong in Korea in July – that's when 150,000 revellers descend on this town on the country's Yellow Sea Coast 200km south of Seoul to wallow like, well, pigs in mud. Mud found on the flood plains around the town's Daecheon beach has long been famous for its cosmetic properties, and in 1998 local tourism officials decided to go beyond just promoting the stuff in jars and tubes for visitors to take home. They trucked it to the beach area to launch their first slap-up Mud Festival, which proved such a hoot it's been held every year since. 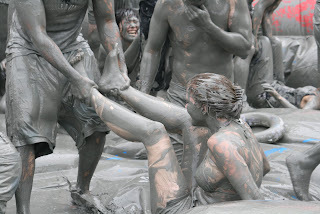 Between July 14 and 22 this year you can wallow in all the medicinal values of Boryeong mud with such events as mud facials, mud hair rinses, mud surfing, mud wrestling, mud sliding, a Mud King competition and a Miss Mud competion, a Human Pyramid (or should that be Pyramud?) contest, a mud cavalry battle, mud canoeing – and at night, wallow back in the pools of mud to watch fireworks. Pity the poor housekeepers – and what would your Mudder say?